Several years ago organizational effectiveness consultant Bernie Saunders presented his change model at a class I was attending. What I remember all these years later (at least 15) is that structure, support and creativity were the three key elements of Bernie’s optimal problem solving model. 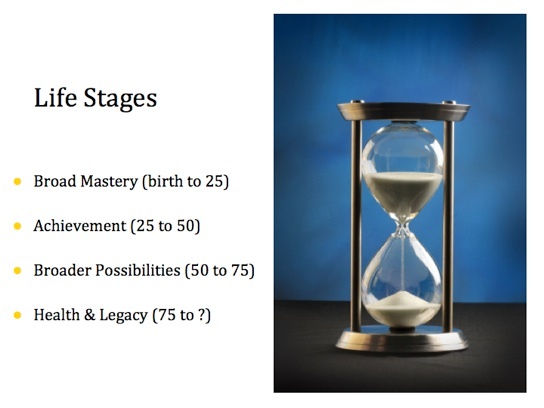 I have thought often about this model and have shared it with many clients and audiences over the years. It works well as is, but I have come to realize that one more element is needed to make it an even more complete formula for change: courage. Faced with the necessity and/or opportunity for change, we each need to start with a structure, a process that makes sense to us and will work over time to move us ahead. We also benefit from the support of others to help us move forward and not get too discouraged or lost along the way. Structure and support by themselves are not necessarily enough to get us past all the challenges, however, and we often need to be creative as well. A less obvious, more clever solution is often what we need. The ability to color outside the lines and creatively reset the strategy can pay big dividends when our path is blocked. Now add to all this one more catalytic ingredient: courage. All the structure, support and creativity will not get us where we want to go if we don’t have the courage to act. We need to take that step, that leap of faith, to get to the other side. Can you picture the trapeze artist getting so close to letting go of the bar, but she just can’t do it? How close that other bar comes, but it is too difficult to let go of the secure, familiar bar even when she knows she needs to do so to succeed, to get to the other side. Courage is the critical element that enables us to let go of the familiar and safe, and reach out for the other side. To hold on only gets us to the edge of change, not to the other side of change. Back we slide if we don’t let go. “During the past few months I’ve had more then the usual number of conversations with friends, colleagues, and clients about transitions they are going through. What has surfaced is the desire to know what could be, if they would dare to let themselves find out. I want to thank Bernie Saunders for his change model and for offering his thoughts on courage in this November entry. This is an excellent book. If you don’t already own it, seriously consider buying a copy for yourself. While you are at it, buy one for someone else who needs it. I have spent twenty-three years as an executive career transition consultant, have read a good many books on this subject, and can say without hesitation that this one is my favorite. It is practical, concise and very well written, especially for executive level networking. One of the authors, Marcia Ballinger, is a highly regarded local retained executive recruiter who really understands this subject. After all these years, one thing remains unchanged. Networking is the number one means for discovering and pursuing your next opportunity. Mastery and maintenance of this skill is imperative. If you are not now in transition, remember the axiom; “Make friends before you need them”. Recommit to giving and receiving networking help and advice. Use this book to take your networking to the next level, then pay it forward. Isn’t it inevitable? In so many projects, after the forming comes the storming and then the questioning. Even when you can name a dozen good reasons why you joined this particular cause, you are now having serious doubts. Abandon ship, or stay the course? Read on. At the time, I was groping for a strategy for coping with the “messy middle” of a project I had committed to. I decided to try Charlie’s suggestion, and remembered his words on the way in to a particularly challenging meeting. Speeding along in my car, just ten minutes from the start of the meeting, I imagined, and I felt, the ride home. At the stoplight I closed my eyes and started looking into the faces of each member of the group. Soon I was smiling. We were thanking each other for what we had just accomplished, for the generosity, for the commitment. I was amazed at how good I felt on that ride in, and the next. When the meeting began, my blood pressure was lower, my optimism and patience higher. I hope this bit of advice can help you hang in there when you face a similar challenge. The next time you find yourself cursing your way to that volunteer engagement, think about the ride home. It may seem simplistic, and it won’t work all the time, but it is worth a try if you are pulling your hair out and need to see with different eyes. Community service of all kinds is good for the spirit, good for the soul, good for making connections, good for finding purpose and contribution both when you are gainfully employed and when you are not (most of my clients are executives in transition, and I always encourage volunteerism). 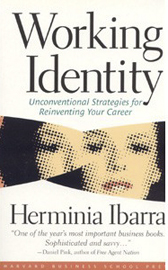 If you start to dream of a big shift in your career and/or life direction, I have the perfect book for you: Working Identity, by Herminia Ibarra. This book begins by offering great advice and case studies that illustrate how one makes a big shift by starting with small experiments, shifting to new connections and then eventually making sense of what has been learned. When the book came out in 2003, it was a game changer in the career transition industry. It has the credibility of the Harvard Business Press, and has been universally praised for its simple, straightforward and effective model and its great stories. I highly recommend the book, and encourage you to consider how you might benefit from Ibarra’s three step process if a big change is in your future. Trying out new activities and professional roles on a small scale before making a major commitment to a different path. This might include: volunteering, pro bono work, board membership, committee work, freelance work, taking a class, new readings, job shadowing, moonlighting, joining a new organization, etc. Developing contacts who can open doors to new worlds: finding role models and new peer groups to guide and benchmark our progress. Developing stories that explain who you’re becoming in light of these new activities and new relationships. Deciding to sharpen your focus and commit or circle back and regroup. Is it too late for you to run away and join the circus? Herminia Ibarra would say probably not, but she would also suggest proceeding with caution by starting with small steps, having lots of conversations with successful “circus” performers, and then decide later, after enough experiments, conversations and reflection have taken place. If you are interested in expanding your options, read on to the next section below about career alternatives. More satisfying possibilities might be just around the corner. Is the circus calling? 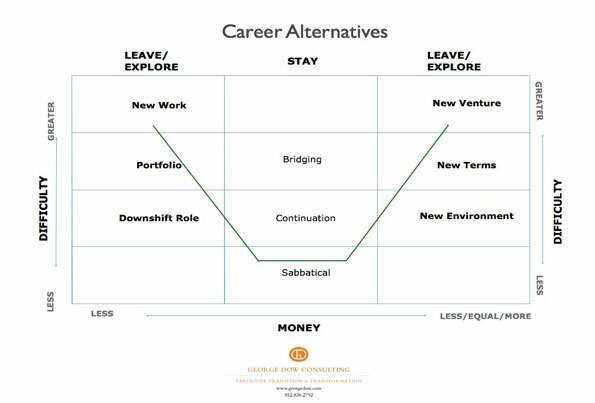 A few years ago I created the model below to help my career transition clients see and name more options than the two most common; a new job much like the last one, or entrepreneurship. I also thought it would be helpful to show the economic factors and degree of difficulty for each option. Take a look. What option(s) are you considering? We all need a plan A, plan B, and why not an additional seven, just in case we need them too? Change in compensation terms, including contract work, part-time, and/or flexible schedule. 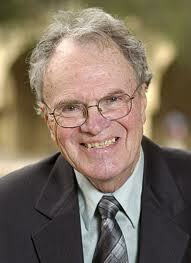 Starting a consulting practice, buying or starting a business or buying a franchise. 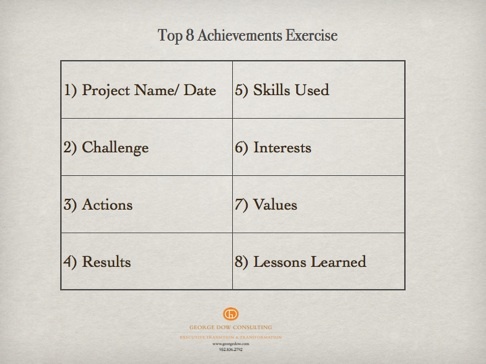 To move from your most recent role to a lower level of responsibility and/or lower title. 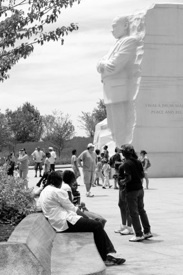 Redistribution of time committed to work, community and personal activities. 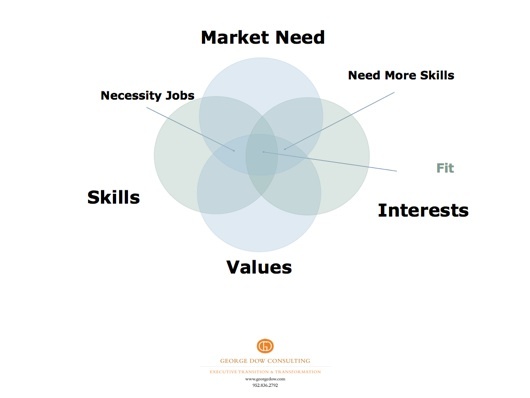 Significant change in the nature of work, using different skills and/or expertise. Strategically moving from one option to another over time, establishing timelines and personal, work and financial benchmarks. Building bridges to the next step, while engaged in the current path. What comes next is the happenstance part. You just don’t know what will come your way when you network for information, advice, referrals and opportunities. You also have to be cautious with what lands in your net. Is that opportunity looking like a good catch or an Asian Carp? Happenstance can be good, can be bad. Take good care of yourself, keep tying your knots, casting your net, creating your luck!